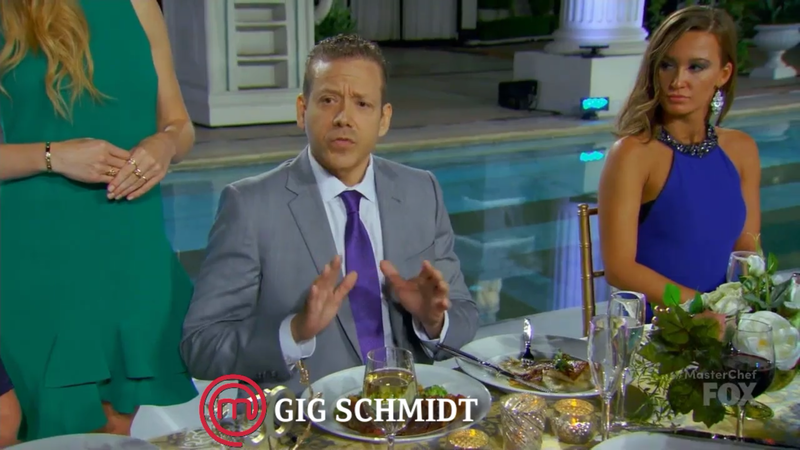 Gig was “cast” to be a VIP dinner guest and judge on the television show MasterChef which was celebrating Caesars Palace’s 50th anniversary. This was not an acting role, nor was it paid in the traditional acting sense. Gig saw a casting notice about it here http://www.auditionsfree.com/2016/masterchef-casting-diners-las-vegas/# and responded as he would for acting gigs by sending his photos to the email address listed in the casting notice. He then received a follow up email that requested that he send additional details such as his occupation, which is business owner, and perhaps age, height, weight and any food allergies. 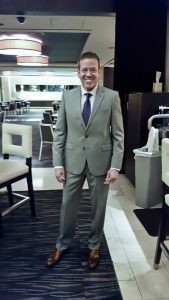 In this follow up email Gig also included an additional photo of him in a custom made suit which was also the only photo he sent in a three piece suit. Gig was surprised that he was selected because of the specifics stated about who the producers were seeking. They stated they were seeking “Vegas’ most influential players”. Gig said that if the parlance of “players” meant gamblers than he would not qualify because he does not gamble. And if the term had a more generic definition meaning Las Vegas’s most influential people or residents, again Gig said that he did not view himself part of that group. On-set, the only one that Gig thought met that criteria was Sean McBurney the General Manager of Caesars Palace. The approximate time is 11:30P-3A on Tues night. 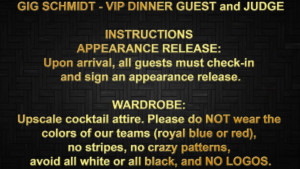 As for attire, it really is whatever you would like as long as its upscale cocktail attire. No need to bring multiple options. I have received this email and I am confirming attendance. Can you provide the approximate timing again of the event? And for males, what color suits do you prefer and do you want 3 piece suits to include the vest, or just 2 piece jacket and pants? And do you want ties worn as well? 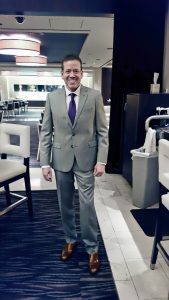 Should we bring multiple options for suits, ties and shoes? Welcome! You are confirmed to be a VIP diner for the MasterChef taping honoring Caesars 50th Anniversary in Las Vegas on Tuesday September 20th. Please REPLY ASAP to this email to confirm receipt. You will receive a phone call with a final confirmation by Monday 9/19. TIME: 11:30PM. If you are running late, please call/text. Please find the Seven Stars Valet at Caesars (off of W Flamingo Rd) and report to the Diamond Lounge where a MasterChef representative will be standing by to check you in. 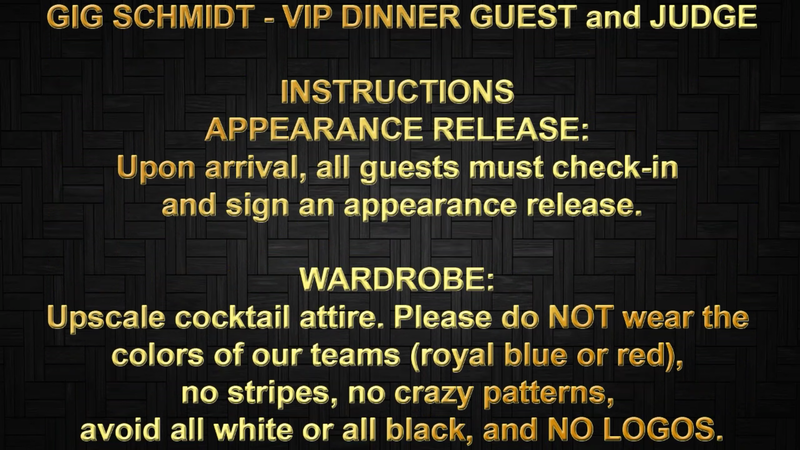 APPEARANCE RELEASE: Upon arrival, all guests must check-in and sign an appearance release. WARDROBE: Upscale cocktail attire. Please do NOT wear the colors of our teams (royal blue or red), no stripes, no crazy patterns, avoid all white or all black, and NO LOGOS. IMPORTANT NOTICE: Because this is a competition, the home cooks must feed an exact number of guests. By confirming this email, your attendance is accounted for in this number and your attendance is expected. If for any reason you cannot attend, please notify producers immediately as we will need to replace your seat. In the holding area, before the event, Gig sat and chatted with Chef Joshua Grimes who was a chef at Bucchanal Buffet which is one of the Caesars Palace restaurant’s. Joshua was also a former contestant on Cutthroat Kitchen season 11 episode 8 “Cashew if you can”, where he finished in second place. Joshua was a same day replacement for a higher ranking Caesars Palace employee who could not make the event. 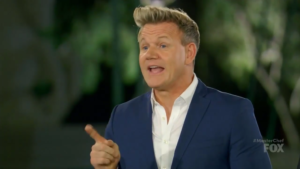 At the time of checking in Gig was told that this episode of MasterChef would air in approximately ten months, which would equate to approximately July 2017. Although pictures were not allowed on-set, many people took pictures before being seated when they gathered mingling away from the tables, and were served champagne. Even Gig attempted to take a photo with the set as the backdrop but the person he asked to take his photo could not operate the camera properly. Some people seated at the end of the table where Gig sat even took selfies on-set at the table during the shoot. Of the 50 attendees Gig’s preassigned number was 23, which determined where they were to sit at the table. 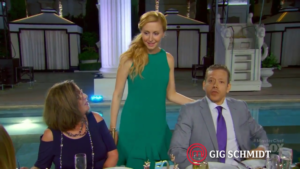 On-set Gig recognized Gordon Ramsay and Christina Tosi. 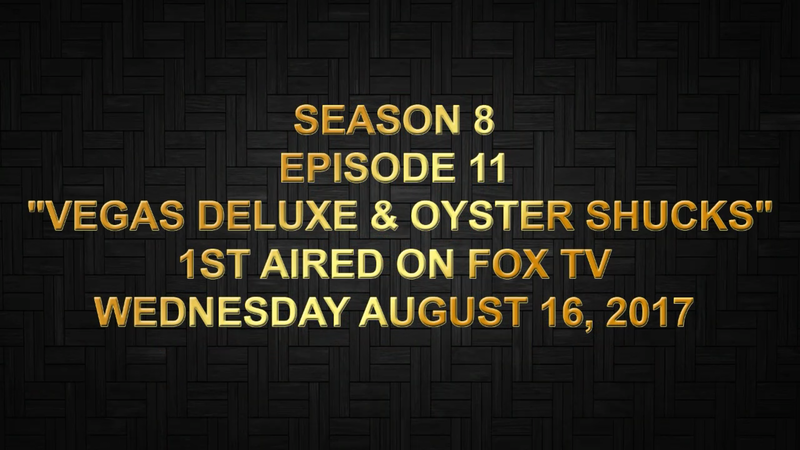 During the filming Gig was interviewed on camera by Christina Tosi and later by another female off camera who was probably a member of the production staff who gave instructions on how to provide verbal feedback by stating the team color along with the entre type, and how to verbally cast their vote for which team the diners preferred. Gig was interviewed on camera to cast his vote verbally, and it appeared that not all diners were interviewed on camera. A month or so later someone that was a fan of the show asked Gig if the voting results were legitimate and said that he heard stories about the validity of reality TV. Gig said that the diners did indeed vote according to their own personal choices, but he can not verify if those votes were tallied and delivered accurately on-air. On-set, diners where instructed to place the card of the color of the team they wanted to vote for in what would normally be a restaurant check bill-fold. And to place the card representing the color of the team they were not voting for underneath the table cloth in front of them. Servers later collected the check bill-folds. The two color choices were red for the meat entre team, and blue for the seafood entre team. The producers intentially chose those colors so that it was easy for the diners to identify each team. Red for red meat and blue for ocean blue fish seafood. Due to the confidentiality agreement that Gig signed, he said that he will not disclose which team he voted for or which team won until after the episode airs. In addition to filming Gig in his interviews, production also filmed Gig’s fish dinner plate in a close up. Note: all diners received both a fish entre and a red meat entre to evaluate. Photo taken August 29, 2016 and submitted in September 2016 by Gig to the MasterChef casting/selection committee after he initially submitted with other pictures. Gig wanted the casting department to see him in a custom made suit, and a three piece suit. Once Gig was selected to appear on the show he asked what they preferred him to wear such as a two or three piece suit, with or without a tie, and suit color, but they simply responded with, “whatever you would like as long as its upscale cocktail attire”. Photos taken by Chef Joshua Grimes in the holding area before going to set. In Gig’s left hand is his #23, which was his seat assignment at the table. Numbers were from 1-50. MASTERCHEF IS CELEBRATING CAESARS 50TH ANNIVERSARY! We cordially invite Vegas’ most influential players to join MasterChef for an unforgettable dining experience to honor the 50th Anniversary of Caesars Palace. Please join us for dinner and cocktails for this milestone event! further details. You MUST be 21 or older to attend. *PLEASE MENTION ANY FOOD ALLERGIES/DIETARY RESTRICTIONS! 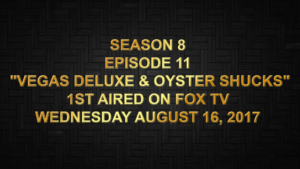 MASTERCHEF IS PRODUCED BY BERKELEY PRODUCTIONS, INC.